I didn’t set out to determine what happened in last Sunday’s fourth quarter collapse. Instead, I only wanted to know how the Eagles attempted to cover Larry Fitzgerald during the entire game. The subsequent conclusion only came by accident. I re-watched every Cardinals offensive play and recorded where Fitzgerald lined up, the Eagles player who matched up across from him, the result of the play, and my best assessment of the coverage scheme. My full notes can be found in this Google spreadsheet. Let’s start by looking at Fitzgerald and the Eagles through the first three quarters. Here’s what I complied starting with where the receiver lined up, who covered him and how, and the results of passes targeted at him. For starters, we see that Fitzgerald lined up wide on both sides of the formation equally, 24 plays each, with 6 slot appearances thrown into the mix. When Fitzgerald was in the slot, he received a mixed bag of coverage and caught one big pass against Dominique Rodgers-Cromartie (didn’t help that Kurt Coleman missed a tackle). Against Asante Samuel on the right side, Fitzgerald mostly encountered zone coverage between Samuel and Jaiquawn Jarrett. Finally, on the left, Nnamdi Asomugha largely played man-to-man press coverage. Overall, Juan Castillo’s secondary did well against Fitzgerald through three quarters. They limited his targets to only 6 in 52 plays and only 2 official receptions. The touchdown came when Fitzgerald cut inside against the zone and split two linebackers. So what happened in the fourth quarter? Fitzgerald took a few extra snaps in the slot, which Castillo partially countered by assigning Asomguha to a couple of those plays. Yet again Fitzgerald split his time equally on both sides. The big difference came in the number of targets and completions against Samuel in zone coverage on the right side. John Skelton only targeted Fitzgerald 6 times total through the first three quarters. That pattern continued in the fourth quarter in all but one formation. Skelton threw to his big target 6 times just in the final quarter against Samuel. That wouldn’t be a big deal except that he also completed 4 of those passes for 83 yards and one touchdown, including the biggest play of the game, when Samuel let his man go and Jarrett got beat deep, leading to the game-winning touchdown. There’s blame enough for all. Samuel certainly didn’t play at a Pro Bowl level and Jarrett looked like a rookie making his first start. But the most damning thing is how predictable the defense looked in each formation. 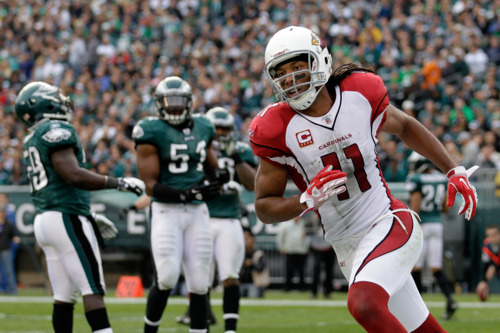 By the time the fourth quarter arrived, the Cardinals knew exactly the type of match up they’d have on Fitzgerald in each position, and they exploited that by attacking the Eagles tandem on the right side for the final 15 minutes. On that game-changing pass, for example, the Cardinals knew that if they stuck Fitzgerald on the right side, chances were he’d be in zone coverage with Samuel on the outside and Jarrett deep. A crossing route underneath to woo Asante, a double move to fool the rookie, and the Cardinals won the game. That’s how you lose five fourth quarter leads. Tagged with Philadelphia Eagles, NFL, Week Ten, Arizona Cardinals, Fourth Quarter, Larry Fitzgerald, Juan Castillo, Asante Samuel, Nnamdi Asomugha, Dominique Rodgers-Cromartie, Defense, Coverage, Joselio Hanson, Kurt Coleman, Jaiquawn Jarrett, Zone, Blitzing, John Skelton. November 18, 2011 by Brian Solomon.